Dennis has come a long way since he burst into newsprint, his hair in his eyes and a trail of jam behind him. 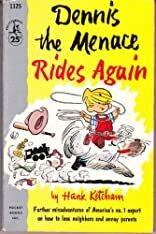 Here in DENNIS THE MENACE RIDES AGAIN is the little guy at his irrepressible best-a professional tyrant, a sophisticate in short pants, an old hand at puncturing large egos, a remorseless operator with a streak of bravura a mile wide. And as much as we (and millions of others) love him for his high-jinks and high spirits, we love him even more for doing-with incredible aplomb-the things we never dare to do ourselves. About HANK KETCHAM (Author) : HANK KETCHAM is a published author. 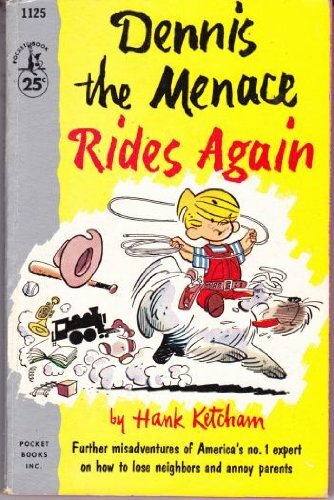 Some of the published credits of HANK KETCHAM include Dennis the Menace: Prayers and Graces, Dennis the Menace Rides Again, Dennis the Menace Ol Droopy Drawers.